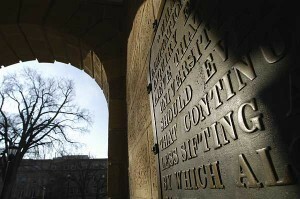 The University of Wisconsin System Board of Regents is meeting in Madison Thursday and Friday, April 4 and 5. The meeting, originally scheduled to be hosted by UW-Whitewater, will be held at UW System office in Van Hise Hall, 1220 Linden Avenue. Livestream coverage of the meeting is available here. Regents met in committee Thursday morning. The Education Committee considered approval of a change in UW-Green Bay’s mission statement and two UW collaborative degree programs. The committee also heard updates on the UW System associate degree program and the UW System Task Force on Advancing Teacher Education and School Leadership in Wisconsin. The Business and Finance Committee heard updates on shared services and considered approval of new salary ranges for executives and several contractual agreements. The Capital Planning and Budget Committee considered approval of several building and renovation projects and heard an update on State Building Commission action. The Audit Committee heard updates on audit reports, risk management and compliance. The full board will meet in closed and open session Friday afternoon. The board will discuss student behavioral health, the restructuring of UW Colleges and UW-Extension and high impact practices in open session. On Friday, the board will hear reports from the Board President John Behling and UW System President Ray Cross and consider approval of committee action. Updates on the chancellor search at UW-Whitewater, President Trump’s recent executive order on campus speech, and the 2019-21 state budget are on the agenda. The University of Wisconsin System Board of Regents will meet in Madison Thursday and Friday, February 7 and 8. UW-Madison is hosting the meeting, which will be held in Varsity Hall at Union South, 1380 West Dayton Street. A webcast of the full board portions of the meeting is here. The Business and Finance Committee will review and consider approval of several graduate and non-resident tuition increases at nine UW System institutions. UW-Madison is not among the nine campuses with proposals. The committee will also hear several reports and presentations, including one from UW-Madison. The Education Committee will consider approval of several charter school proposals and three new degree programs, including a Bachelor of Science in Health Promotion and Health Equity at UW-Madison. UW-Madison Provost Sarah Mangelsdorf will provide an update to the committee on UW-Madison educational innovations. The Capital Planning and Budget Committee will consider approval of two capital projects, including a remodeling project at UW-Madison’s DeLuca Biochemistry building, and a revision of evaluation criteria for major capital project requests. The committee will also hear an update from UW-Madison and a report on recent State Building Commission action. The Research, Economic Development and Innovation Committee will hear an update from UW-Madison on UW2020 research and innovation grants and report from UW-Eau Claire on new partnerships created by the UW-Eau Claire Finance Department. The Audit Committee will hear several reports and an enterprise risk management update. The full board portion of Thursday’s meeting begins at 1 pm with a welcome from UW-Madison Chancellor Rebecca Blank. The board will hear two reports before moving into closed session to discuss personnel, disciplinary, and legal items. UW-Madison football coach Paul Chryst’s employment and additional compensation agreements are among the items on the agenda. The full board meets for a second day at 9 am Friday. UW System President Ray Cross and Regent President John Behling will each provide updates to the board and UW-Madison will deliver its annual NCAA Division I Athletics report. The board will also recognize recipients of the 2019 Diversity Awards. In advocating for the UW-Madison faculty, PROFS vigorously defends academic freedom. State Representative Dave Murphy’s criticism of political science professor Ken Mayer’s course is an attack on academic freedom. It could have a chilling effect on future faculty members’ willingness to speak freely and openly about controversial topics of the day, a very unfortunate outcome. PROFS applauds groups like the College Republicans for standing up for Professor Mayer. These students recognize that Professor Mayer is a fair professor who is nonetheless willing to speak critically and honestly. That is a key element of the Wisconsin Idea. The University of Wisconsin System Board of Regents will meet at UW-La Crosse Thursday and Friday, December 6 and 7. All meetings will be held in the student union, 521 East Avenue North. The full board portions of the meeting will be livestreamed. The Education Committee will discuss many items including the approval of procedures relating to financial emergency and program discontinuance that require faculty layoff and termination at UW-Stevens Point (below). The committee will also hear several reports and consider changes to several Regent Policy Documents and approval of new degree programs at UW-Stevens Point, UW-Milwaukee, and UW-Green Bay. The Business and Finance Committee will meet jointly with the Audit Committee before meeting to discuss several items, including faculty turnover (below). The number of faculty at all UW System institutions has declined from 6,485 to 5,983 over the past five years, with 434 faculty leaving in FY18. Last year, faculty turnover at UW-Madison was about 5%. Eighty-two tenured faculty members left — 58 retired and 24 resigned. Twenty-two probationary faculty left — 18 resigned and four were non-renewed. The committee will also consider two contractual agreements and hear a report on faculty and staff base salary adjustments. The Capital Planning and Budget Committee will discuss several building and renovation projects and hear several reports. The Research, Economic Development, and Innovation Committee will hear the UW School of Medicine and Public Health annual report and consider approval of the Wisconsin Partnership program’s five-year plan. After meeting jointly with the Business and Finance Committee to discuss the Plante Moran external audit, the Audit Committee will discuss internal audits and internal controls and enterprise risk management. The full board meets in open and closed sessions Thursday afternoon. Governor-elect Tony Evers has been invited to address the board at 1 pm. The board will also hear from UW-La Crosse Chancellor Joe Gow and consider a resolution in support of a faculty and staff pay plan of 3% increase in each year of the 2019-21 biennium (below). The recommendation includes a provision for the state to fully-fund the pay plan given the the likelihood for a continued tuition freeze. Friday, the board will hear reports from Regent President John Behling and UW System President Ray Cross. PROFS is pleased to cosponsor a campus forum on faculty entrepreneurship and innovation at 4 pm, Thursday, November 15. Register for the event here. The University of Wisconsin System Board of Regents will meet at UW-Parkside Thursday and Friday, October 4 and 5. All meetings will be held at the UW-Parkside Student Center, 900 Wood Road in Kenosha. Livestream coverage of the full board portions of the meeting is here. The Education Committee will consider a new degree program in video production at UW-Stout and mission statement change at UW-River Falls. The committee will also hear reports on UW System restructuring and teacher education in Wisconsin. The Business and Finance Committee will consider two contractual agreements at UW-Madison and hear reports on topics including program revenue balances, financial management, information security, shared services and performance funding. The Capital Planning and Budget Committee will consider two remodeling projects at UW-Madison — Helen C. White Library and Memorial Library. The committee will also hear presentations on UW System building conditions and UW-Parkside’s capital planning and budgeting. The Research, Economic Development, and Innovation Committee will hear two presentations — an update from UW-Parkside women innovators and an update from the Wisconsin Economic Development Corporation on Foxconn supplier initiatives and partnerships. The full board meets Thursday afternoon and Friday morning. Thursday’s agenda includes reports from UW-Parkside Chancellor Deborah Ford (partnerships), UW-Madison Athletics Director Barry Alvarez (safety review), and UW-Milwaukee, UW-Oshkosh, UW-Parkside and UW-Stout (capacity building efforts). Friday’s agenda includes committee reports and updates from UW System President Ray Cross and Regent President John Behling.